In the late ’80s and early ’90s, grunge and alt-country simultaneously came of age, and although the music of each movement superficially was quite different, the two styles shared a similar sense of disaffected angst. As the original drummer for Screaming Trees, Mark Pickerel was at the heart of the Seattle scene when Nirvana burst into the limelight — for a brief time during the late ’80s, he backed Krist Novoselic and Kurt Cobain — and by all accounts, Screaming Trees should have held an equal hand in its bid for stardom. Van and Gary Lee Conner’s inability to cooperate, however, caused such tension and turmoil within the band that it had trouble getting off the ground. In the meantime, Pickerel left to pursue an eclectic array of his own interests. Over the course of the past 15 years, he unassumingly has amassed a solid body of work by performing with the post-grunge collective Truly, supporting the likes of Neko Case and Brandi Carlile, and most importantly, fronting The Dark Fantastic, an outfit that increasingly appears to be the linchpin that holds together the disparate strands of his solo career. With the release of his latest effort Snake in the Radio — the first to be issued under his own name — Pickerel further scales back the production flourishes, leaving behind The Dark Fantastic’s psychedelicized meshing of Pink Floyd, Buffalo Springfield, and Echo and the Bunnymen. In doing so, he reveals another act that not only has weighed quite heavily upon his post-Screaming Trees output, but also has helped to blaze the original alt-country trail: the seminal, roots-rock band The Knitters. Considering that Chicago’s Bloodshot Records almost singlehandedly carried the torch for X’s country-punk offshoot in the years that spanned the group’s dissolution and reformation, it’s only fitting that the label is also behind Pickerel’s latest transformation. 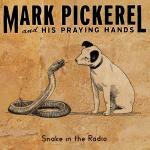 Snake in the Radio is available from Barnes & Noble.